GameSpy online server browser has stopped working due to GameSpy services being shut down. See manual server replacement to replace the GameSpy servers. The retail version's default Direct3D renderer runs badly in fullscreen on Windows 8 and later; see low frame rate fix to address the frame rate problem. SafeDisc DRM[Note 1]; see Run without the CD. Rune Classic. Also comes with Rune Gold. Rune Gold is the base game along with the Halls of Valhalla expansion. 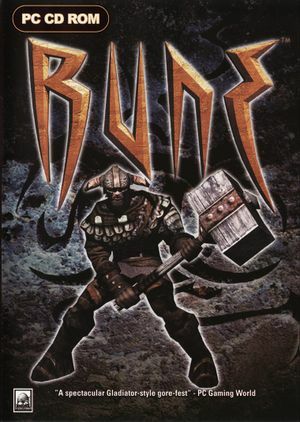 Rune Classic is an updated version of Rune Gold that includes enemies from the PlayStation 2 version, Steam achievements, a modified soundtrack, and a reworked single-player campaign (levels have been either removed or rebalanced). The cut levels can still be played separately or restored using Rune Extended. Stand-alone multiplayer expansion pack that adds new multi-player modes and skins. The Unreal Engine Direct3D 9 renderer is a renderer for Unreal Tournament, Deus Ex, and Rune that allow these games to have better compatibility on modern operating system. It also has some extra graphical enhancement options such as anti-aliasing, anisotropic filtering, fullscreen gamma correction, and V-sync. The Unreal Engine Direct3D 10 Renderer is a renderer for Unreal, Unreal Tournament, Deus Ex and Rune that aims to provide a good, consistent looking and future-proof renderer for these games. The focus is not on fancy effects; the idea is to have something that will allow these games to perform well and look good on modern systems. 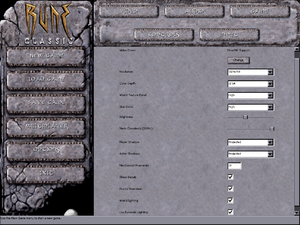 Not needed for the Rune Classic release as it supports Direct3D 11. Find the line Video= under the "[URL]" section and comment out the line with an apostrophe (e.g. 'Video=Intro.ogv). Save the changes. The game should instantly take you to the main menu. Rune.ini is used for the game's general settings such as video, audio, network settings, and controller sensitivity. User.ini stores keybindings and gameplay-related settings. Default.ini and DefUser.ini are used in case the aforementioned files are deleted and their default settings can be restored. Save*.usa files are used for the single-player campaign. Files 0-8 are used for the game's nine save slots; Save9.usa is used to restart at the beginning of a level; Save10.usa is used for Rune Classic's checkpoints. Native support in Rune Gold. For more info and methods for "Classic" releases, see the WSGF entry. For Windows 8 and 8.1 in the retail version, see here. Change DesiredFOV= and DefaultFOV= to match the desired FOV. For 16:10 resolutions, set the values to 85.3. For 16:9 resolutions, set the values to 91.3. Can be toggled with Alt+↵ Enter or using the console command ToggleFullscreen. Go to Advanced Options menu under Display. Use Unreal Engine Direct3D 9 or Direct3D 10 renderer. Anisotropic filtering can also be hacked through video card settings. Anti-aliasing can also be hacked through video card settings. Go to Advanced Options menu under Rendering. For the Direct3D and Direct3D 10 renderer, set "UseVSync" to True. For the Direct3D 9 renderer, set "SwapInterval" value from -1 to 1. Disabled by default. Uses DirectInput. See Controller support. Menus requires interaction from mouse. Controller buttons in the Options menu are referred to as "Joy1", "Joy2", and so forth. Some controllers may require this fix. Go to Advanced Options under the "Joystick" section. Go to Advanced Options and open the "Joystick" section. Adjust the ScaleXYZ and ScaleRUV values to desired amount. Search for Axis aLookUp speed= on the assigned axis and set this value to a negative number. Cutscenes only. Combat chatter not subtitled. EAX 2 and A3D 2.0. See manual GameSpy server replacement. Under unknown circumstances, a specific weapon type (sword, axe, or mace) will become bugged, and the player will become unable to pick up that type of weapon from the environment. The retail release of Rune uses an old Direct3D 7 renderer that runs poorly in fullscreen on Windows 8 and 8.1 due to poor implementation of older Direct3D support. This issue however is not present in Windows 10. The GOG.com and Steam versions are not affected by this due to the addition of Direct3D 11 support in 2018. This only works on the original versions of Rune and Halls of Valhalla expansion. Download the Direct3D 9 or Direct3D 10 renderers from the links provided. Extract the contents of the zip file into <path-to-game>\System. Launch the game, go to Video settings, then click Change under "Video Driver" and restart the game. At the Video Configuration window, select the "Show all devices" option, then select either Direct3D9 Support or Direct3D 10 Support, and click Next to finish. The game will restart with the selected renderer. This fix is for Rune Classic as it does not support third-party renderers. Extract the contents of the folder anywhere on your computer, then copy the DDRAW.dll from the folder that matches your operating system into <path-to-game>\System. Download and install Borderless Gaming. Press Ctrl+F and search for instances of master.gamespy.com and master0.gamespy.com and replace them with master.333networks.com. After replacing all instances of the GameSpy servers in Rune.ini, save the changes (File → Save or Ctrl+S). Now launch the game and go to Multiplayer. The new server should be active for multiplayer modes. Press Ctrl+F and search for NetSpeed and LanSpeed in both files, then change the values of these settings to a higher number (e.g. 50000). Now try starting or joining a multiplayer game, the download speed should now become faster. Save the changes. The server list should not crash the game anymore. 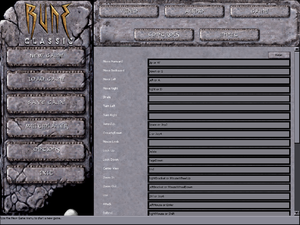 7, 9, 10, 11 Support for 11 was added in June 2018 with a patch for Rune Classic only. For the retail version, to add in Direct3D 9 or 10 support, see Unreal Engine Direct3D 9 or Direct3D 10 renderer. Required Mac OS and Linux; optional for Windows. GameSpy GameSpy servers were shut down in March 2015. Rune Extended is a mod for Rune Classic that re-implements the cut levels into the single-player campaign. It is recommended to back up your Maps folder before applying this mod. Loading a save file from a map that has be replaced can cause issues. ↑ 3.0 3.1 File/folder structure within this directory reflects the path(s) listed for Windows and/or Steam game data (use Wine regedit to access Windows registry paths). Games with Steam Cloud support may store data in ~/.steam/steam/userdata/<user-id>/210950/ in addition to or instead of this directory. The app ID (210950) may differ in some cases. Treat backslashes as forward slashes. See the glossary page for details. Tested by commenting out the "Video=Intro.ogv" line from Rune Classic's Rune.ini file and video was skipped. Measured the frame-rate using the "stat fps" console command without V-sync and frame-rate was above 120 FPS. 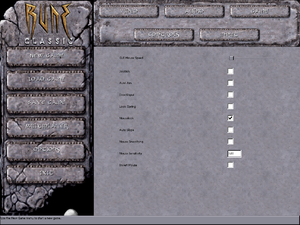 Ran Rune and Rune Classic on Windows 10 in fullscreen with the orignal Direct3D 7 renderer and frame-rate was not affected unlike Windows 8.1 where it halved its frame-rate. 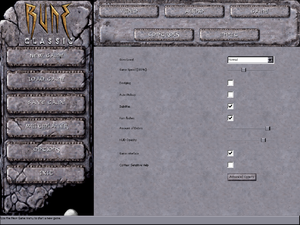 Ran Rune on Windows 8.1 in fullscreen with the Direct3D 9 and 10 renderers and frame-rate was not affected. Used Borderless Gaming on Rune Classic on Windows 8.1 and frame-rate was not affected when in borderless fullscreen windowed. Modified the game's setting of 2000 NetSpeed to 50000 and noticed a substantial difference in downloading speed. This page was last edited on 16 April 2019, at 02:46.